Best in class teams deliver embedded products with 0.1 bugs per thousand lines of code (which is two orders of magnitude lower than most firmware groups). They consistently beat the schedule, without grueling overtime. Does that sound like your team? If not, what action are you taking to improve your team's results? Hoping for things to get better won't change anything. "Trying harder" never works (as Harry Roberts documented in Quality Is Personal). The nice folks at Siglent sent me one of their SDS1102CML 100 MHz bench scopes for evaluation. This $379 unit offers a ton of value for the price. I have made two short videos about the unit. Part 1 is here, and part 2 here. I plan to do a follow up review in a year or so to see how the unit holds up. 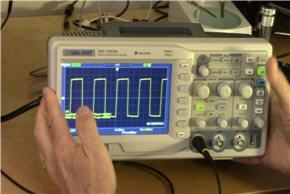 I mentioned the low-cost Siglent digital bench oscilloscope above. Other vendors have units at similar price/feature points. Do you have comments about any of these units? I have a serious addiction to the Unix command shell and use it for all sorts of scripting needs. Cygwin is one option to move those capabilities to Windows. Do check out the free UnxUtils tools, which are native Windows applications and are very fast. There are about 120 tools (like grep, awk, sed, tr) provided. ; Operation: This converts a directory full of files. ; - Ultraedit is loaded and the article pasted into it. ;   all the spaces removed, and all lower-case. Earlier this year a bug was discovered in Apple's SSL code. Can you spot it? The second goto from the bottom should not have been there. In this small snippet the double gotos do sort of "jump" out (pardon the pun), but this is buried in a 2000 line module. ... which I think would have made the error much more obvious. The MISRA standards (available here for £15 each in .PDF form) define rules for the safer use of C and C++. Few people like all of the rules; I have quibbles with a few. In school a 90% is an A, and that often applies to life as well. The MISRA rules easily score 90% and are recommended. (And, yes, I know that in software even a 99% is an F! Roughly speaking, a million lines of code with 99% correctness means 10,000 errors). As the old Wendy's ad exclaimed, where's the beef? This is the assets section of Microsoft's 2013 annual report. Cash, equities, equipment and other tangible and intangible ("Goodwill") assets are listed. But doesn't their IP have some value? Isn't it astonishing that accountants still view software and other forms of intellectual property as valueless? How much is Windows worth to Microsoft? If every physical asset disappeared in some catastrophe, they'd survive. But if that same fate befell their IP, if Windows' source code disappeared, they'd likely fail. Windows is worth billions, maybe hundreds of billions to that company, yet no accountant recognizes its value. They're too busy toting up the cost of the stationary. At most companies inventory lives behind a locked fence. A stern-faced clerk makes you sign for every part. Want a tenth-of-a-cent resistor? Fill out the form. In duplicate. But inventory is itemized on the balance sheet, so accounting insures that asset is as protected as the business's cash balance. Yet IP often lives on uncontrolled servers, vulnerable to angry employees and acts of God. Or simple typos. Type in rm -r and a lot of stuff goes up in smoke. If the balance sheet listed IP all source would live behind some virtual locked fence, guarded by a dour-faced clerk or unfriendly bit of software. And that might indeed be a good thing. Over half of us don't make use of even the most minimal sort of configuration management, so we routinely experience expensive problems. The NEAR spacecraft failure was partially attributed to a CM issue -- they launched the wrong code! Two versions of the 1.11 flight code existed; one was tested, and the other was used. The FAA announced in the late 90s they lost all of the code to control flights between Chicago O'Hare and the regional airports. No one used a version control system and an angry employee purposely deleted it all. If CPAs tracked IP they'd quickly understand the ethereal nature of software and other designs, and they'd quickly learn how a single transient can wipe out most of a company's value. Petty pilferage of inventory would drop to a side issue as they designed robust backup strategies. And that might be just what we need. Uttering the words "it's just a software change" would become a firing offense. Mention a quick upgrade and the accounts would gasp "you want to do what? Do you have any idea of the value of that asset you plan to desecrate?" Track the real value of software and the accountants will complain bitterly to upper management when impossible schedules threaten to wreak havoc with the code. Maybe -- just maybe -- estimation would become a real process respected by everyone. After all, no CFO will permit management to raid cash coffers unless there's a demonstrated need. They require a disciplined cash management strategy, one recognized by the SEC and their own accounting board. Track the value of IP, and the only companies abusing their code will be the Enrons, social outcasts doomed to fail. I have worked with three companies in the last couple of years whose entire engineering departments were consumed by fire. Two were fine; they valued their IP carefully (though not on the balance sheet), and kept extensive off-site backups. One didn't, and the company folded as a result. Version control is the first element in protecting IP, as the VCS stores the code on a server backed up regularly by IT (hopefully). Engineers are generally not good at the routine of daily rollouts. On the hardware side, developers need to be thinking about VCS as well to protect their IP -- the schematics, VHDL, Verilog and all that can be as complex as the code. A lot of people wrote about computing and/or managing worst-case execution time (WCET). Here are a couple of interesting comments. We have a few tips for practical ways to handle this. If you are using any form of scheduler which uses regular timer interrupts to kick tasks, measure the number of clock ticks still remaining before the next interrupt when each task ends. Record a running average and a minimum. This gives you average duty cycle and worst case actually executed. For some systems it is acceptable to have overruns as long as the system can catch up without it being a disaster. On the topic of overruns, if the system tick increments a counter rather than sets a flag, then you can catch up even with overruns. If the counter is greater than 1 then decrement it and let the system know a tick has occurred. Of course do the check in a foreground / background task data safe way or else the interrupt can come half way through the check and that leads to disaster. We also use a pair of diagnostic LEDs to help with a visual indication of system load. One is usually allocated to the system tick for non-RTOS based systems. We turn it on when the tick happens and turn it off when the main loop picks up that the tick has happened. In an ideal world this is close to zero duty cycle. The more it is on. The more you are exceeding you timeslots. The second LED is allocated to a task we want to monitor the duty cycle of. On at the start, off at the end. You can then use a Logic State Analyser to loot at the actual timing in detail. Between them, these are a good indicator of possible issues to be aware of or adjust accordingly. One of the patents in my name involved scheduling events so they were guaranteed to always occur on time. This involved modelling the execution times of each task and scheduling based on that. Not for the faint hearted but this was a biomedical instrument handling patient samples and they don’t like to have to operate again if the machine screws up the processing. Ok, Round 2 of this WCET stuff. One problem I have with caching is it's effect on system correctness and timing arguments. These affect your field just as much as mine. My ideal on-chip memory has fine-grained control, predictability, plenty of space, and uses minimal chip resources. Looking into this stuff more I rediscovered an old technique that embedded guys probably know well: scratchpad memory. I used to love this stuff but forgot it after I had to exclusively work with cached architectures. It met *every single requirement* on my list minus maybe space compared to some COTS offerings with ridiculous cache sizes. So, I decided to look for empirical evidence for or against it in the problem domain. I looked into academic work to see if I could find any comparisons of scratchpad and cache, esp involving WCET analysis. What I found confirmed my suspicions: scratchpad memory is what you people need. And before anyone gripes about manual memory management, I'll quickly add that the tools (i.e. compiler) can handle that for you. The two papers supporting this assertion, one on scratchpad advantages & one on timing comparison, are attached. John Black sent this link about a smoking power supply.